ECO or Engineering departments are organization entities to which ECOs are assigned. ECO departments are not tied to any inventory org structure but it gives flexibility based on business need to setup engineering entities. 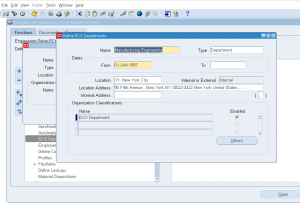 ECO Departments are setup using the same screen as Inventory Organizations or Operating Units. 7) Enabled Flag: Check the flag to enable. 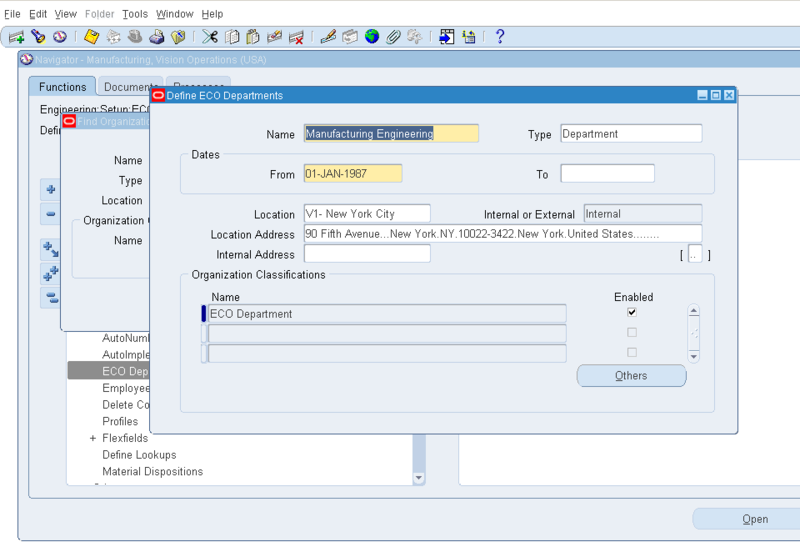 Deletion Constraints are additional rules that system validates before deleting any master objects like ITEMs, BOMs, ROUTINGs and ECOs. Some deletion constraints are seeded (comes out of box), each business can add/impose additional constraints. 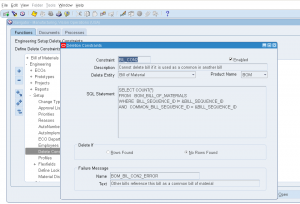 5) Delete if: You can select either “No Rows found” or “Rows found”, this is based on SQL statement written above. 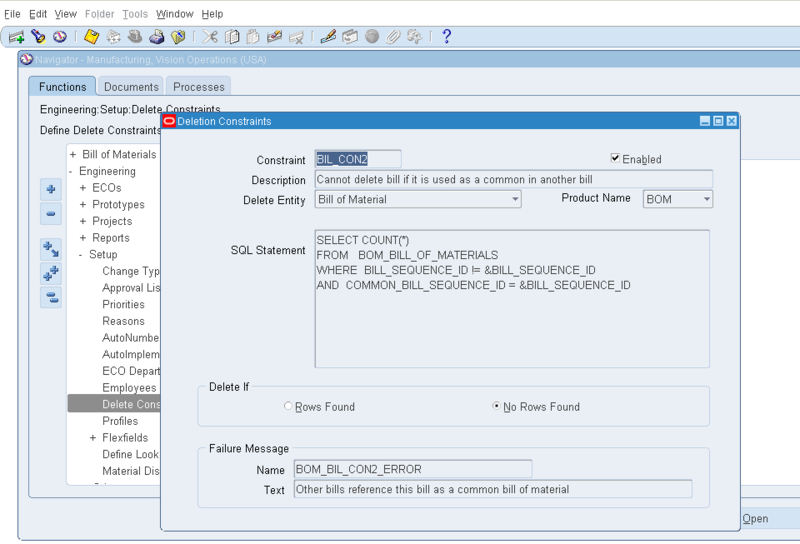 6) Failure Message: If deletion constraint met and can’t be deleted, then what should be the message to be displayed. 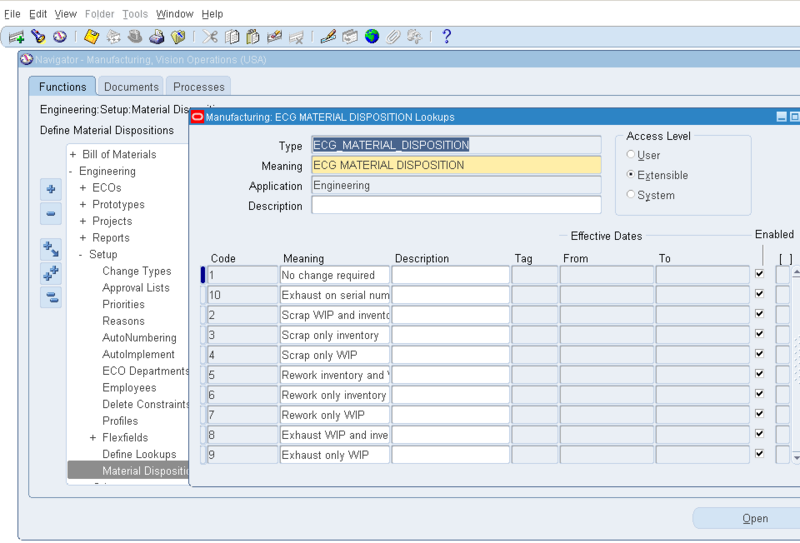 ECO Material Disposition Codes are setup in Oracle Engineering module. These codes are used for updating dispositions on Engineering Change Orders (ECO). Material Disposition Codes are extensible lookup codes that means they comes with some seeded (out of the box/standard) values and each business can add new codes to it as required. Enter the Code, Meaning, description of new lookup values. 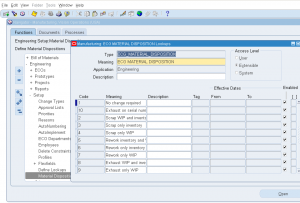 Check enabled flag to activate the lookup code.